Don’t see the time you want to play? We are available for private parties outside normal hours! Please check our calendar below. Note: outside of normal time reservations are available 48 hours in advance.If you cannot find a date and time that accommodates your group needs, please give us a call. Air Assault Paintball is Minnesota’s ultimate indoor paintball experience. Our premier paintball field is located in St. Paul, MN and is the best paintball near you. We feature the widest range of paintball hours in the area. 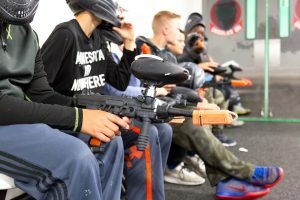 From low impact paintball to tournament grade paintball our facility is perfect for your next birthday party, family event, bachelor party or company outing in the Minneapolis area.